Last December, I decided to partake in the very trendy aquarium filtration media that is biopellets. 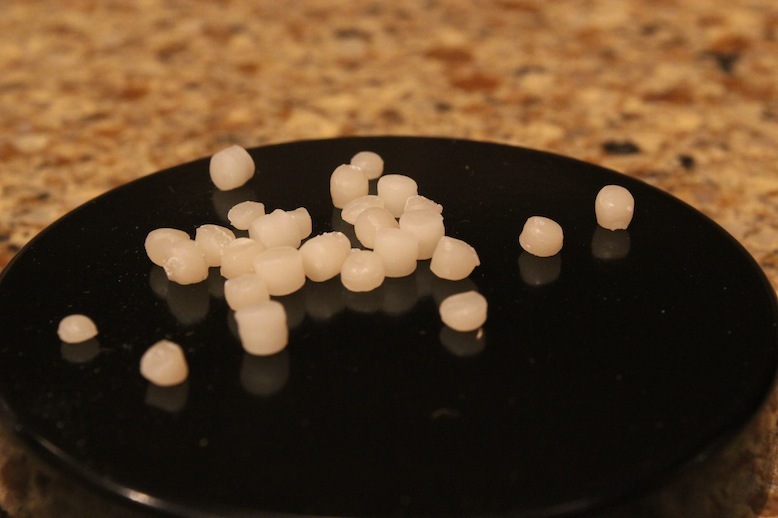 The solid carbon pellets, according to all of the bullet points, seemed to be the best way of feeding bacteria populations in the aquarium, which in turn would consume nitrate and phosphate in the long term. Since I was in the middle of a bad dinoflagellate outbreak that water changes, carbon, GFO, bacteria dosing, and long periods of no light couldn’t knock back, I was a bit desperate to try something outside of my comfort zone. Soon after, I found myself in possession of a container of Dr. Tim’s NP-Active Pearls that I eventually seeded with bacteria from Prodibio’s BioDigest and put into use on the dinoflagellate ridden aquarium. Within a few short weeks of biopellet use, we saw some spectacular results, but would that success carry on for the foreseeable future? About a month after starting the biopellets, I noticed pretty much all of the positive things that aquarium hobbyists have been saying. The tank looked cleaner, the dinoflagellates were gone, the protein skimmer was really making some sludge, and nitrate and phosphate numbers were down. Needless to say, things were going great and I was officially a fan of the media. Fast forward to the four month mark and things started turning sour. Around that time, I topped up the media, but nothing really changed other than that. Unfortunately, that’s also the same time that cyanobacteria started to rear its ugly head. Fully aware that the purple slime is a known byproduct of biopellet use, I just upped the frequency of my water changes and hoped that the cyano problem would work itself out. It persisted, however, and grew to be an ever larger problem, prompting me to increase the water flow in the tank significantly. None of these fixes seemed to work, and the cyanobacteria stuck around despite my efforts. Regardless, I proceeded with the biopellet use hoping that things would straighten out. After roughly eight months of biopellet use, I did some some preliminary water testing and found the phosphate number actually shot up during the experiment. Despite all of the RO/DI filters being replaced and adding carbon to the mix, the pellets just didn’t seem to work. At that point, tired of tinkering around with them, I officially took the biopellets offline and decided to crank up the GFO once again. It’s only been a couple of days since quitting the pellets cold turkey, and to be honest, the tank is looking a bit cleaner already. The cyano is still there, but it completely disappears over night and comes back slower and slower each day. All of that experimenting aside, I haven’t completely written off the biopellets. Aquarium keepers are still attributing tons of benefits to their use, and perhaps the next system I try them on will be better. After all, the worst that could happen is another outbreak of cyano, which will be fine because the tank will likely not be housing corals and fish for a while. I have been using NPX for a little more than 2 years now. I have seen the same cyano problem in 2 tanks. Originally, I assumed it was an excess carbon amount (which pellets are supposed to prevent) as commonly seen it tanks that dose vodka. Since then I have changed my theory, and I attribute it to an excess of PO4 with an absence of NO3. The pellets are very good at reducing NO3 but dismal at best in comparison for PO4. In my experimenting, I eventually had to run GFO with biopellets which took care of the PO4 problem and the cyano went away. This is without any alteration in water change schedule, which was typically 10 – 20% per week, depending on the tank. I would like to see a controlled experiment to confirm this, but per my observations this is what is happening with respect to the cyano / pellet situation. I switched over to distilled vinegar with a dosing pump. Cheaper and easier to adjust than pellets. If I need more or less I simply adjust the dosing time on my Apex. In my ~2 years use of and research looking into NPBiopellets I have noticed several things. You still need to use GFO if your desire is to have no phosphates as is mine. They do pretty good helping out nitrate removal. My bout with cyano was solved a year ago by putting the outlet from the pellets into a DIY manifold attached to the inlet of my skimmer. Latest test results from water testing: phosphates 0ppm and nitrates 5ppm. Good topic, I’ve shared in Spanish for Zona Reef users. Very suitable for those starting in the use of BioPellets. Thank you. In short, the appearance of cyano is not totally unexpected in a carbon dosed system……. Remember that NO3 and PO4 are taken up in a specific ratio, Redfield comes to mind, but the reality is that we are more often than not adding nutrients in an unbalanced ratio, with PO4 additions exceeding no3 additions in terms of balance. Furthermore, NO3 will often become undetectable with solid and liquid carbon dosing, which limits the uptake of PO4 by bacteria., i.e. NO3 becoming the limiting factor in PO4 uptake. The then available PO4 will serve as a nutrient for cyano. It has always bugged me that some manufacturers market their pellets as NO3 and PO4 “removal” substrate, leading to hobbyists thinking that PO4 removing substances such as GFO is not required. Even though claims of manufacturers are not technically wrong, as bacterial biofilm growth will assimilate PO4 into their biomass, it simply does not do it in a manner which alleviates PO4 needing management on its own. Make sure the pellets are not made from corn. All corn is GMO, which is poison! What temperature was the water when you had issues with cyano? I used bio pellets for months and I must tell you that my 65 gallon tanks ran at 0 nitrates and phosphates no matter how much I fed the fish or corals. Now, with that said, I did not like the way my corals were looking. Hardly any growth with dull coloration. All of my water parameters appear to be correct. I was advice by a LFS that I may be running my tank dry, in other words with very little nutrients for my corals to do better. So as of yesterday, I remove the bio pellet reactor…I hope everything turns out OK.
Do you add any coral foods to the tank? Amino acids and such? It’s not good to starve the corals and it sounds like your tank may be too clean! The product is good but it sounds like you might need to use less and target feed the corals just like the Zeovit method. Thanks. That is what was happenning. I took out the bio pellets and the tank is looking better already. Nitrates are low and there is no detectable phosphates. No algae problems either. Clearly you didn’t follow the recommended way of using the product, so stop moaning about it not working.